Labour in turmoil: Who's gone from the shadow cabinet? A Bridlington born MP is to officially launch her opposition to Jeremy Corbyn's leadership of the Labour Party today. Former Shadow Business Secretary, Angela Eagle, says she wants to unite the party. Mr Corbyn said he was disappointed over the leadership bid. Shadow health secretary Diane Abbott has told ITV's Good Morning Britain that Angela Eagle's support for the Iraq invasion and an increase in tuition fees show she is the "Empire Strikes Back" candidate against Jeremy Corbyn. The Corbyn-supporting Abbott said her party's embattled leader must be on any leadership ballot as she played down talk of splits within the party and reports of political "Armageddon". She joined Daily Mirror associate editor Kevin McGuire in doubting Eagle's success in a race with Mr Corbyn as the pair were questioned about the stature of a challenger who came fourth in a previous race for Labour's deputy leadership. Angela Eagle is to launch her Labour leadership contest on Monday, but how does it work? Ed Balls has told Peston on Sunday that Angela Eagle's leadership bid is "essential" as Jeremy Corbyn "can't do the job". The former shadow chancellor said no one believed Corbyn could ever become prime minister. "Frankly there is no message at all coming from Labour in the last two weeks about what the solutions to these big problems are," he told Robert Peston. "There's got to be a change. It's not just necessary for Labour, I think it's necessary for the whole country. "We need a strong opposition which believes it can form the next government and I'm afraid nobody thinks Jeremy Corbyn is going to be the prime minister of our country." The MP for Scunthorpe Nic Dakin has resigned from the Labour Front Bench after "further failure of leadership" from Jeremy Corbyn at today's PLP meeting. 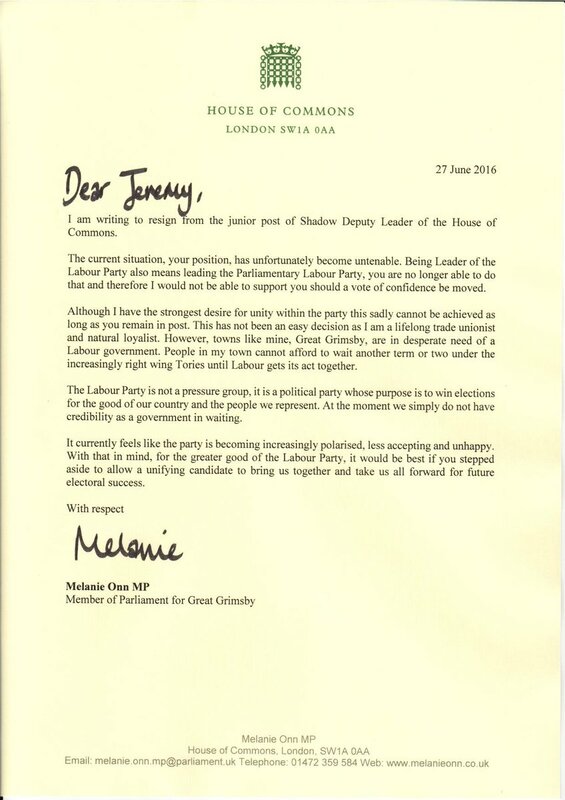 The Great Grimsby MP Melanie Onn has joined her fellow Labour MPs in Hull and resigned from her role on the front bench. This is the moment Dennis Skinner shook Jeremy Corbyn's hand before appearing to flick the V-sign at the former shadow cabinet following their resignations. Prominent Labour figures Angela Eagle and John Healey have both resigned from their positions on the frontbench. 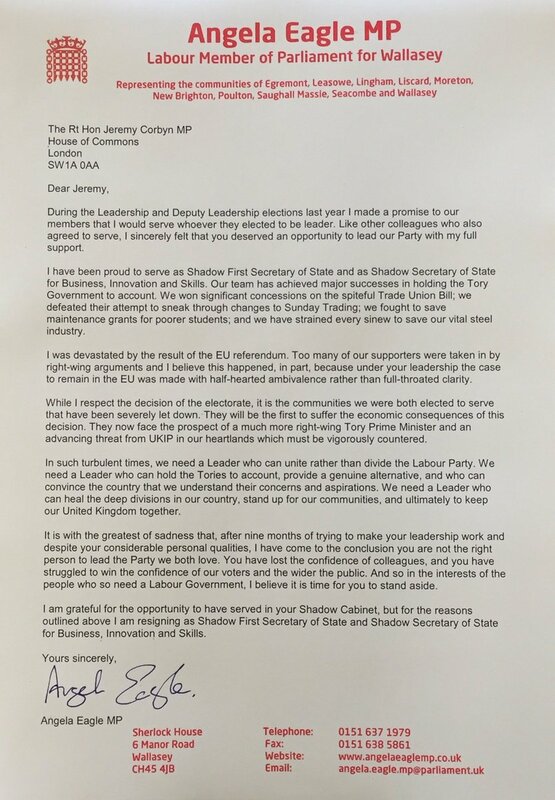 Healey has resigned as shadow housing minister, while Eagle quit as shadow business secretary, saying that the Labour Party needs a "leader who can unite rather than divide". 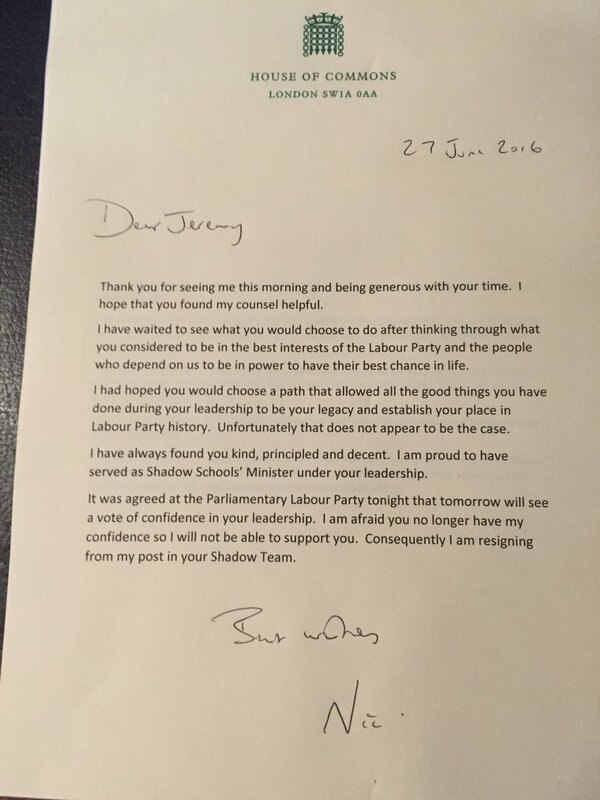 Can Jeremy Corbyn ride out wave of resignations? Students debate: Should we stay ... or should we go?